In this edition of Music Behind the Ride, I'm focusing on two different live shows with the music front and center at Universal Studios Hollywood. Besides the famous Studio Tour, live shows became the next addition in the 1960s with stunt shows following through the 70s and 80s. It wasn't until the 1990s when rides started appearing at the park. 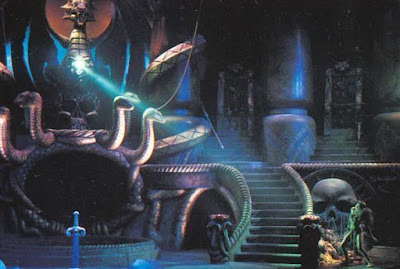 After the run of the classic monster show Castle Dracula (1980-1983), Universal turned to Landmark Entertainment to create a live stunt show based on 1982's Conan the Barbarian. Opening in summer, 1993 The Adventures of Conan: A Sword and Sorcery Spectacular wowed audiences in the live stage production. Featuring state-of-the-art lasers and pyrotechnics, the 20 minute show also featured a 18-foot tall fire breathing dragon. Instead of following the film's plot, the show followed Conan and Red Sonja fighting an evil wizard and henchmen in a classic good-versus-evil story. As far as the music needed, Conan the Barbarian composer Basil Poledouris was brought in for the stage show. While it sounds like it fits in his Hyborean Age style, no themes from the film score were used. Like the film, the show is nearly scored wall-to-wall. Poledouris kept a lighthearted action/adventure tone, helping emphasize the sword and sorcery than the brutality of the film. Even in the short production, a new romance theme and new heroic Conan material were introduced. 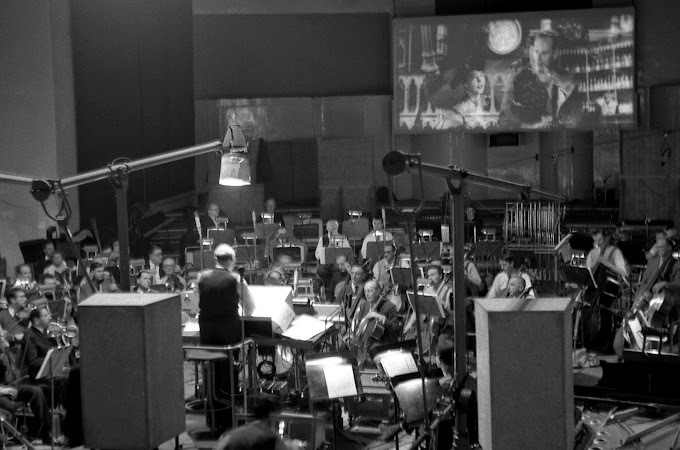 Usual collaborator Greig McRitchie orchestrated the score and was conducted by Poledouris with the London Studio Symphony Orchestra and choir. 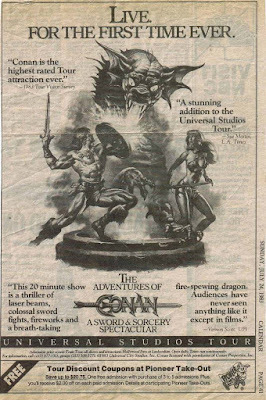 The Adventures of Conan continued at Universal Studios until 1994. The Castle Theatre continued live shows like Beetlejuice Graveyard Revue, Spider-Man Rocks! and most recently the Special Effects Stage show. In 2000, the recording of the Poledouris score was released on the Super Tracks label. The 24 minute album features a portion of the show complete with booming narration along with the music as recorded. The Sword and Sorcery Spectacular made it to disc yet again in 2011, this time paired along with the City of Prague Philharmonic Orchestra re-recording of Conan the Destroyer (1984). Meanwhile, across the park, action stunt shows of The A-Team and Miami Vice ran through the 1980s and 90s. While filming was going on, the next stunt show became WaterWorld: A Live Sea War Spectacular. Opening in fall 1995 (after the summer film opening), the 16 minute show featured the gigantic pool, live stunts, large pyrotechnics, and jet-skis which soak the arena's front rows. The seaplane entrance is a highlight for sure. Taking place after the film, Helen returns after discovering Dryland and is pursued by Deacon and the evil Smokers until The Mariner shows up to save her. As soon as you walk into the 2,500 seat arena, the film's music is piped in. 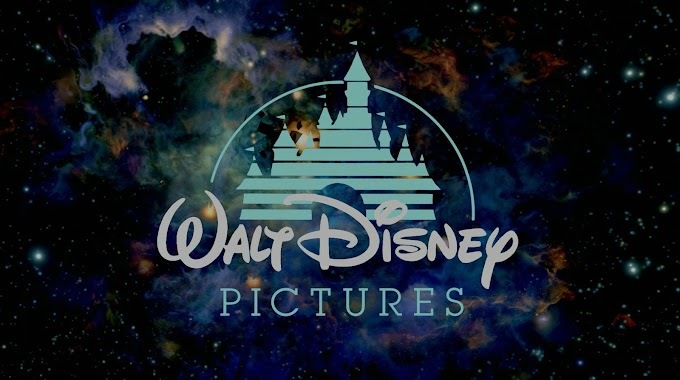 Instead of a newly composed score, tracks from the James Newton Howard soundtrack are used. During the preshow seating, you hear Deacons Speech looped. The Main Title is heard under the opening narration. The Atoll underscores Helen's entrance. With most of the large action set to Escaping the Smokers, it's easy to get that swashbuckling music stuck in your head as you leave. The WaterWorld show at Universal Hollywood is still running, even if a majority of the audience hasn't seen the film it's based on. The attraction expanded to Universal Studios Japan in 2001 and Universal Studios Singapore in 2010. The show was refined in 2014 and referbished in 2017 with slightly adjusted characters, plot and sound system. As far as recordings, almost everything is looped from the original soundtrack, so no official show recording has been released. 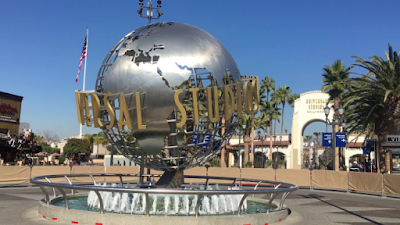 Universal Hollywood and Universal Florida have some other strong film score connections. Let me know if there's ride or attraction you'd like featured in the next Music Behind the Ride!